I've had too many to count thanks to Clemson game days, a Clemson paw temporary tattoo on my cheek, and staring into the sun while watching a Clemson football game. Well, even though it's officially winter, you can still get exposed to those pesky UV rays - especially in places like Glendale, Arizona where our Clemson Tigers will be taking on Ohio State on New Year's Even in the Fiesta Bowl. I never thought about which sunscreen to use, until I recently learned about a new line called Beautycounter through Beautycounter consultant Meredith. After I learned about the Beautycounter sunscreen products and their commitment to safe ingredients, I asked Meredith if she would share more about Beautycounter with you AND offer one of the Beautycounter sunscreen products as a giveaway prize! Congratulations Clemson Tigers! In just a week, you will head back to Glendale, Arizona - this time to meet the overrated Ohio State Buckeyes in The Fiesta Bowl. The sun is pretty strong out in Glendale, so you will definitely need to pack some sunscreen! And even if you are not headed out there for the game, a good sunscreen is always smart to have on hand. It is also important for that sunscreen to be SAFE. Your skin is your biggest organ and it is estimated that it absorbs over 70% of what you put on it. In 2014, the Environmental Working Group (EWG) found that more than 75% of sunscreens contained toxic chemicals that can increase your risk of cancer and other health issues. 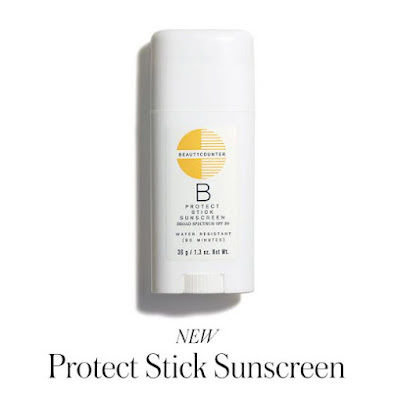 Beautycounter's Protect Stick Sunscreen is exactly what you need- effective AND safe! It contains non-nano zinc oxide, which is an effective, natural mineral sunblock that works by reflecting and scattering UV light rays. It contains hydrating aloe, as well as antioxidant-rich green tea and blood orange extracts to fight free radicals. It is lightweight, water-resistant and blends seamlessly, leaving no white residue. Have you heard of Beautycounter? We are a skincare and cosmetic company that offers completely SAFE yet high performing products. We are part of a movement to change the highly unregulated personal care and cosmetic industry by teaching people what is inside the products they are currently using and offering them a safe and effective alternative should they choose to want something different. Beautycounter promises never to use over 1500 ingredients and to test every ingredient they do use. Their commitment to transparency is unparalleled in this industry. Take a moment to look at The Never List and compare it to what is in your products. Giveaway will end at midnight the night of Wednesday, Dec. 28th. ClemsonGirl.com will randomly draw one winner and contact the winner by email. If the winner doesn't respond within 72 hours from when the email is sent, a new winner will be drawn. Good luck and Go Tigers! Visit my Beautycounter website to check out the rest of our amazing products. Or email me at merbeautycounter@gmail.com if you want to talk more about the company, mission or products. Thank you for the reminder to pack my face sunscreen!!! Will you be in Phoenix?! ?